Skateboard can lead to a myriad of other activities. Most skaters are also very creative by nature, take a look at recent Cuban born artist Tocayo, or at the dinosaurs of deck design like Jim Phillips, or Sean Cliver, let alone pros like Mark Gonzales or Lance Mountain whose paintings are often displayed in exhibitions across the globe, for example. 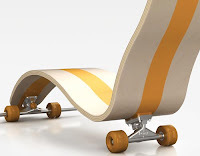 Skate Design can be expressed in a lot of different ways, by writing, painting, doing music or even designing furniture. That is the preferred way of Florent Lasbleiz, a native from Brittany, in France where surf is tough in cold and troubled waters and skateboarding is irregular, because of poor weather conditions and a lack of infrastructures. After he saw his daughter watching TV again and again restless in his longboard, he got the idea to design this rare board. 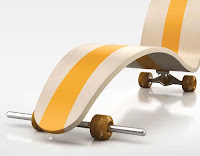 The board is made for people that want to relax but that can’t stand still while sitting on a chair, by pushing on the axle of the front truck, alternatively with the right, then the left foot, you initiate a motion and there it goes. The “chair” was selected for various exhibitions in Europe and Russia and is the mascot of the 2010 French “festival de la glisse” that hosts surfing, Skimboarding and Skateboarding contests in Normandy (France). 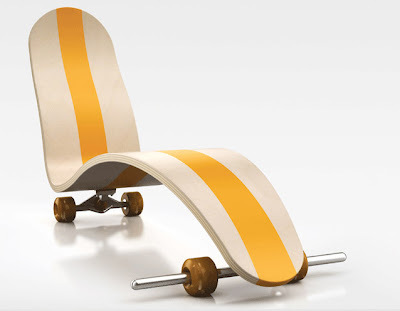 With Florent Lasbleiz skate chair, “Relaxing doesn’t necesarily mean, not moving…” The skate chair value is about 1300 - 1500 €.